With the help of a highly experienced and compassionate doctor like Dr. Jamie Guthrie, even the direst of dental problems can be overcome. Our Ardmore team offers a variety of effective restorative dentistry services, from relatively minor tooth-colored fillings to extensive tooth replacement solutions like dentures. Above all else, we’re focused on helping you achieve the oral function you need in a comfortable and long-lasting fashion. If aesthetics are important to you, we can also use highly natural-looking materials to create results that blend in seamlessly with the rest of your smile. New patients from Lone Grove, OK and other surrounding areas are always welcome at our practice. Please don’t hesitate to contact us today if you’re in need of restorative care, or if it’s simply time for a checkup. We enjoy seeing the whole family! Dark amalgam fillings may have been the restoration of choice for correcting cavities in the past, but today, there’s a much better, more cosmetically friendly option. Dr. Guthrie primarily offers tooth-colored fillings here in Ardmore for patients in need because of their valuable advantages. Tooth-colored fillings are made of high-quality composite resin, which doesn’t actually contain any metal. Because of this, our team can blend and mix shades in order to find the ideal match for your natural enamel, creating a virtually seamless result. Another important benefit is that composite resin forms a direct bond with what remains of your tooth, strengthening it and reducing the chances of further breakage over time. They also allow Dr. Guthrie to preserve a greater amount of the natural tooth, which is better for your oral health in the long run. 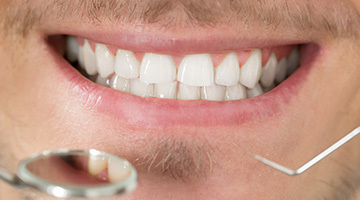 With proper maintenance and oral hygiene, tooth-colored fillings can last for 10-15 years or even longer. You may experience some mild sensitivity after their placement, but this should lessen over time. It’s also recommended that patients refrain from drinking too many staining beverages like coffee or tea over time, as this may lead to discoloration. 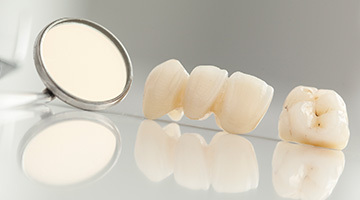 Today, dentures are more modern, comfortable, and natural-looking than ever before. Many patients still prefer them because of their reliable and cost-effective nature, especially when they have several teeth or even an entire mouthful that are in need of replacements. Here in Ardmore, Dr. Guthrie can design the ideal partial or full denture for your unique needs. The traditional models are designed to fit in the patient’s mouth with natural suction and/or strategically placed clasps so that they can remain removable, allowing for convenient storage and cleaning. Alternatively, our team strongly recommends implant-retained dentures because of their improved permanency and health benefits – there’s no need to worry about slippage! If you have teeth that are currently worn down, fractured, or even missing altogether, a custom restoration from Dr. Guthrie can rebuild the strong dental structure you desperately need in a way that exceeds expectations. 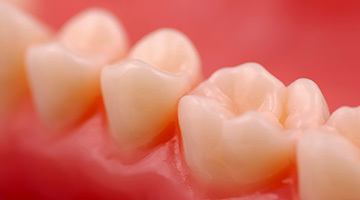 For instance, dental crowns (also referred to as “caps”) are designed to completely cover the visible white surface of a single tooth, protecting the healthy structure underneath while renewing its natural shape, function, and aesthetic appearance. Our team recommends the use of dental crowns in several situations, including the presence of highly weakened tooth, teeth that have suffered traumatic injuries, heavily decayed teeth that can’t be treated with fillings, and even teeth faced with cosmetic imperfections. Alternatively, dental bridges can replace one or more consecutive teeth that have been lost along a single arch. 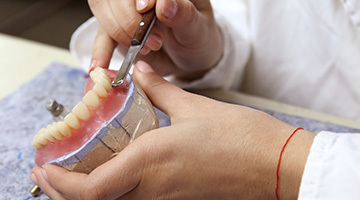 This prosthetic is preferable to traditional dentures for some patients because of its more permanent nature – dental crowns are fitted over nearby healthy teeth as “anchors” in order to fix the bridge in place, making it non-removable. In addition to this traditional model, bridges can also be anchored with implants, which are healthier for the patient and longer-lasting. When a single service just isn’t enough to restore your smile’s full function and health, Dr. Guthrie and the rest of our team can work with you to devise the ideal full mouth reconstruction plan. A comprehensive evaluation will determine your current needs, and we can then recommend a wide variety of services to correct them, such as fillings, dental implants, all-ceramic restorations, and more. Plus, by determining our course before any actual treatment begins, we can create a more convenient schedule of procedures that suits your lifestyle and budget. Your natural tooth is composed of several, equally important layers. There’s the outer layer of strong enamel that everyone’s familiar with, followed by a secondary layer of much more sensitive dentin. Finally, you reach the inner, vulnerable pulp, which contains what’s known as the “nerve” of the tooth. Additionally, these pulp chambers branch off to form canals that lead to the tip of the tooth’s root. When a dental injury or infection is severe enough to reach these areas, pain and even tooth loss can follow. In these situations, Dr. Guthrie is likely to recommend root canal therapy as a highly effective method that can rescue heavily infected teeth from the threat of extraction. Many older patients fear this procedure, but there’s nothing to worry about – today’s modern technology and comfort measures do wonders, rendering the procedure no more uncomfortable than a routine filling. During the process, our team will carefully access the inner tooth and remove the diseased pulp, replacing it with a safe, biocompatible substance before sealing the area shut. A customized dental crown or filling may also be placed as a finishing touch to restore the tooth to its fullest potential. The thought of upcoming dental care makes you feel anxious or outright fearful. You struggle with sitting still and/or holding your mouth open for long periods of time. You’re unable to become properly numb through the regular methods. You have a very sensitive gag reflex. You’re in need of multiple, complex procedures within a relatively short period of time (a single visit). If so, you may benefit from undergoing sedation dentistry at your next appointment here in Ardmore, OK. Dr. Guthrie always makes patient comfort a priority, and she offers both nitrous oxide and oral conscious sedation to help create a much more relaxed atmosphere where you can feel genuinely at ease throughout treatment. While digital X-rays are enormously valuable in helping our team identify and pinpoint dental concerns, their traditional 2D nature has its limits. 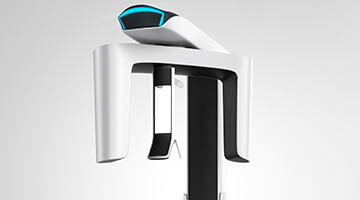 That’s why Dr. Guthrie has also added the revolutionary GALILEOS Cone Beam Scanner to her practice! This technology generates comprehensive, 3D images of your unique smile and facial structures within seconds – we can even view the locations of nerves, bone structure, and other important details. This information makes treatment planning for advanced procedures easier and more precise than ever.